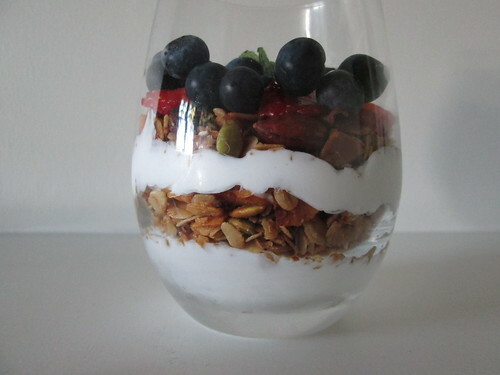 I was feeling a bit fancy this morning, so I constructed this trifle for breakfast, with layers of homemade granola, coconut yoghurt and fresh berries. The granola was freshly cooled from the oven; Erin used this Early Bird granola recipe, but made it a bit less sweet: without brown sugar, and with only half a cup of maple syrup. I found the coconut yoghurt yesterday at the Ceres Fresh Market in Ponsonby Central. It’s CO YO brand, and is amazing: thick, creamy and delicious, with a strong coconut flavour, lightly sweetened with stevia. I’m not a big fan of most vegan yoghurts I’ve tried – I find some commercial soy yoghurts a bit artificial-tasting, and others a bit too health-foodey and fermented. CO YO is neither – it tastes like a real food rather than a “fake” version of a dairy product, and it’s creamy and luscious enough to eat by the spoonful. The dairy-eater in the house says that the flavour and thick texture of CO YO is almost more like sour cream, and she could imagine it being used in salad dressings, dips, or with latkes and apple sauce. 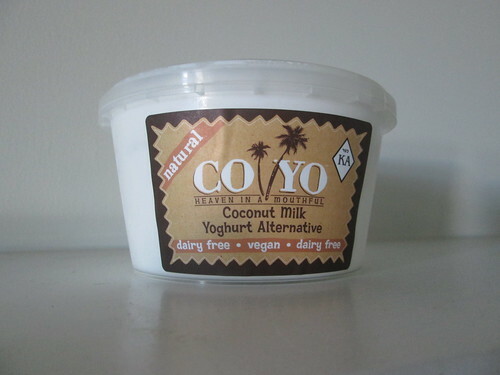 CO YO is a probiotic yoghurt made with coconut milk and plant-fed cultures. I had the plain Natural flavour; you can also find tubs of Mango, Passionfruit or Mixed Berry yoghurt. on the Huckleberry Farms website. The website also refers to CO YO ice cream – it’s not available in New Zealand yet, but Facebook suggests it will be here in February. I’m looking forward to trying the intriguing range of flavours, which include cherry & chocolate nibs, vanilla & nutmeg, and sticky date & tamarind.